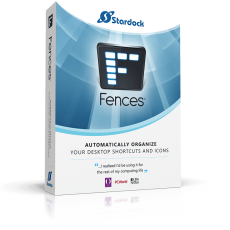 Automatically organize your desktop shortcuts and icons with Fences! Windows users all know this problem: over time, the desktop gets cluttered with icons, shortcuts and documents. Stardocks Fences is a tiny but highly effective program that helps you bring order to your chaotic desktop in style. Items are grouped either by type or individual criteria into translucent boxes that can then be individually created, named, moved and resized. Various display and sort options allow you to create the perfect desktop environment that matches your habits and working style - in just a few clicks! Eliminate clutter from your desktop - but keep your Fences where it's easy to find them - with our roll up feature. Double-clicking on a Fence's title-bar will cause the rest of the Fence to "roll up" into it, saving you valuable space. To reveal your fence, you can move your mouse over the title-bar or double-click it again to view the title and all of its icons as normal. Create multiple pages of fences on your desktop and quickly swipe between them. To change to a different desktop page, just take your mouse cursor to the edge of your screen and click and drag. Then a new page of fences will be displayed. This feature provides greater control over how you can organize favorite programs, documents, websites and more. Instantly clean up your desktop. Double-click any blank space on your desktop and your icons will fade out. Double-click again and they will return. You can even pick icons and individual fences to exclude. Fences can act as a portal to any folder on your PC. For example, your documents or pictures folders can be mirrored onto your desktop as a fence enabling quick access to their contents without adding clutter to your desktop.